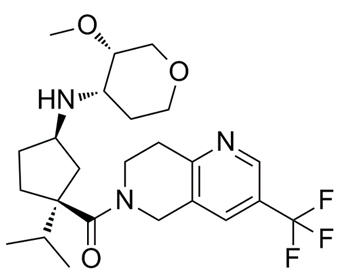 MK-0812 is a potent and selective CCR2 antagonist. Chemokine (C-C motif) receptor 2 (CCR2) is central for the migration of monocytes into inflamed tissues. The inhibition of CCR2 signaling represents a potential therapeutic approach for treatment of metastasis without affecting homeostatic functions.
. Wisniewski T, et al. Assessment of chemokine receptor function on monocytes in whole blood: In vitro and ex vivo evaluations of a CCR2 antagonist.J Immunol Methods. 2010 Jan 31;352(1-2):101-10.
. Min SH, et al. Pharmacological targeting reveals distinct roles for CXCR2/CXCR1 and CCR2 in a mouse model of arthritis.Biochem Biophys Res Commun. 2010 Jan 1;391(1):1080-6.